Pectin is what is known as a gelling agent, in other words it causes things to gel or our jam to set. It occurs naturally in some fruits and is absent in others so we need to keep that in mind when making our jams and add as necessary. You can buy pectin for domestic jam making in the shops. It comes either as a liquid in a bottle or a powder in sachets. Generally they give instructions for use on the packet but as a rule the powdered form is added with the sugar before boiling. 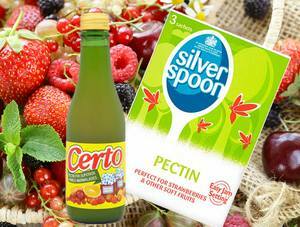 Unlike the pectin naturally in the fruit, the commercial liquid stock is added later in the process after the sugar has been boiled. You can alter the amount they suggest using. If, for example, the instructions on Silver Spoon powdered form say ‘use 13g of pectin powder per kilogram of sugar‘ but you know your jam is only slightly deficient in pectin, then you can halve the amount to prevent the jam being too solidly set. It’s particularly difficult to judge levels when making a mixed fruit jam. You can also buy jam sugar that contains added pectin. NB this is different to preserving sugar that doesn’t contain additional pectin but is formulated to minimise the scum that forms in the jam making process. You can make your own pectin stock if you wish from cooking or crab apples. Crab apples are excellent for making this stock. Take about 1.8 kg (4lb) of washed cooking apples or crab apples. Slice and place in a stainless steel or enamel saucepan. Don’t peel or bother coring, removing the pips etc. Just cover with water and bring to the boil. Simmer until the apples are mushy and then strain through a metal sieve, pushing much of the pulp through into another pot. Leave this overnight and the next day bring back to the boil and reduce the liquid by half. Your home made stock will keep for a couple of days in the fridge. You can freeze it but freezing reduces the its effectiveness. You can also bottle your stock for storage. As a rule, use about 285 ml (½ pint) of your stock per 1.8Kg (4lb) of fruit very low in pectin like strawberries, less with medium level fruits. Making Jams in Microwave & Bread Machines etc.